Southampton Parish, the second most western of the nine parishes is the next Bermuda parish under the Chicago Addick microscope. The parish took it's name from Henry Wriothesley, the Third Earl of Southampton (1573-1624), an English aristocrat and a good friend of William Shakespeare. He served against the Spaniards in the Calais Expedition of 1596 but in 1599 was implicated in the Essex Plot and was sentenced to death, eventually reduced to imprisonment for life. Henry was out for good behaviour two years later. Commuters fr om Southampton can jump the ferry from the Rockaway stop, which only opened in 2002 but has a regular fastish service into Hamilton. 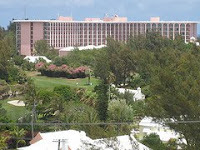 Tourists stay at the popular Southampton Princess Hotel, a giant of a pink building occupying over 100 acres it can be seen for miles. It's private beach is a nice plus and I've never been but the spa is supposed to be the best on the island. The hotel also has a superb par-3 golf course with stunning views. Nearby Gibbs Hill Lighthouse is the Parish's most famous landmark towering 362ft above the island. A very nice, if noisy restaurant has joined a low-key cafe and shop at the foot of the first ever cast iron lighthouse from where the whole island can be seen in it's incredible glory. Revolving on a trough of 1,200 pounds of mercury the light beam can be seen by ships 40 miles away. For those looking for beaches, Southampton has plenty, 14 in fact including the island's best Horsehoe Bay. Bermuda's famous pink sand is on full display here and the arced beach get's very busy during the summer months. Beach tennis, open air movies, sandcastle competitions and other events are often held on sands. 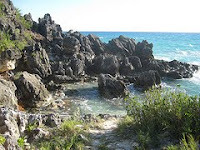 For those wanting just a toe dip and a stroll then from here you are able to walk on a trail past many little coves and parks divided by coral walls. 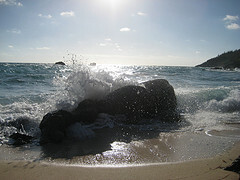 Keep walking until you get to Chaplin Bay, wherte you’re likely to find yourself with little company. For somewhere even more tucked away, try Church Bay (left) a quiet spot and fantastic for snor kelling. I mentioned the par-3 golf course at the Southampton Princess but this parish is an oasis for golfers. The newly opened Port Royal, recent home to the PGA Grand Slam and I have only heard good things about it. Port Royal is a public course. Southampton also has the Bermuda Golf Academy and Driving Range, complete with a half decent Indian restaurant. As well as the driving range, there is also a fun and picturesque mini golf course. For those wanting to see a piece of working Bermuda, then try to seek out Wadson's Farm on Luke's Pond Road. Tom Wadson provides the best organic meat and vegetables for the island's restaurants and you can buy fresh produce from the farm on Saturday mornings and Wednesday and Friday afternoons. Looking east back towards the capital Hamilton, you will stare in wonder at the stillness of the Great Sound. 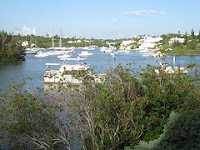 Rent boats or jet-ski's from the place at Jews Bay behind the Waterlot Inn on Middle Road. Southampton has 8 islands within it's parish. They range from the te rrifically named Haggis Island and Little Crumb to the larger and occupied Five Star and Perot (right), on which I had the pleasure to attend a wedding in August. The Parish section of Middle Road, one of only three main traffic arteries on the island is worth exploring by bus or moped outside of midweek rush hours. Going east from Overplus Lane (the boundary of Sandys and Southampton Parishes), you'll be parallel the Bermuda Railway Trail. Explore side roads and view some great sea and land views. The area east of Port Royal Golf Course is particularly beautiful. An area in Southamption for a nice walk, particularly if you had a dog or a pram is Barnes Corner. The buses also turn around here allowing you access to the rest of the island. There are two other hotels worth considering in Southampton. One is the family run Pompano Beach Club which occupies a smashing South Shore location and The Reefs, which has recently had a bit of a facelift. Restaurant wise the best ones belong or are within walking distance of the Southampton Princess. Bacci is a very good Italian and one of my island favourites is Waterlot Inn, a steak restaurant, good but very expensive. For cheaper eats and great entertainment visit the popular King Henry VIII's on South Road near the lighthouse.